We lived about 20 minutes from my grandmas house growing up in California. We had a dinner at her house at least once a week. It is funny how certain foods will forever remind me of her. She is still as fabulous of a cook as ever! 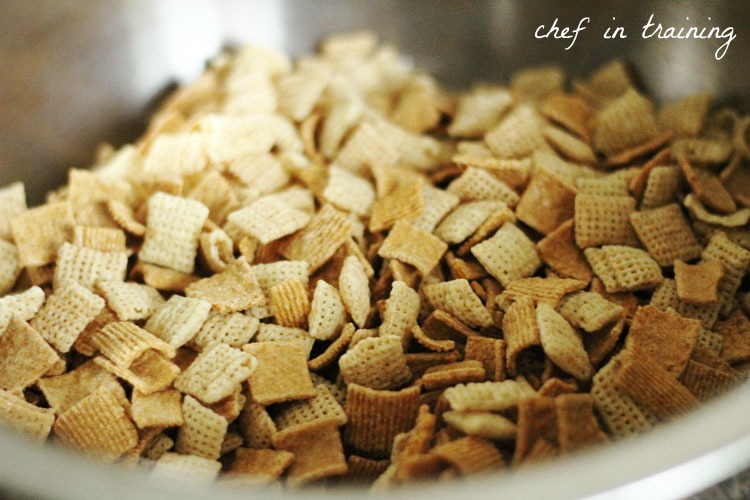 One of the foods she is famous for making is this amazing snack mix. Any family gatherings, reunions, camping trips… you can almost guarantee this will be there. No matter how many times this snack mix makes its appearance, we NEVER get sick of it! Its gooeyness and deliciousness always keep the hands coming back for another helping! Our family adores this recipe and I know yours will too! It is SO easy to make and throw together! Combine cereals together in a large bowl. Set aside. 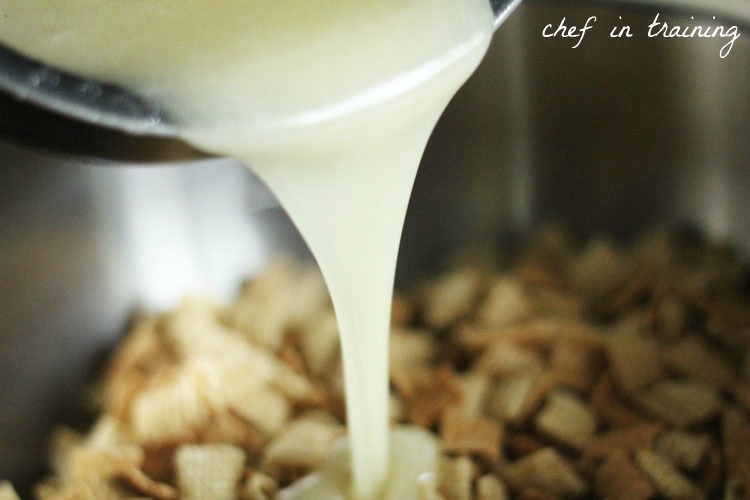 In a saucepan over medium heat, combine sugar, light corn syrup, and butter. Boil for 2 minutes. Pour syrup mixture over cereal. Stir to coat evenly. Add in coconut and almonds and stir to disperse evenly. Let stand for a few minutes. Oh Yum! Can't wait to try this later today! Have to try this one. It sounds yummy. I've been missing your posts but have you back in my reader! 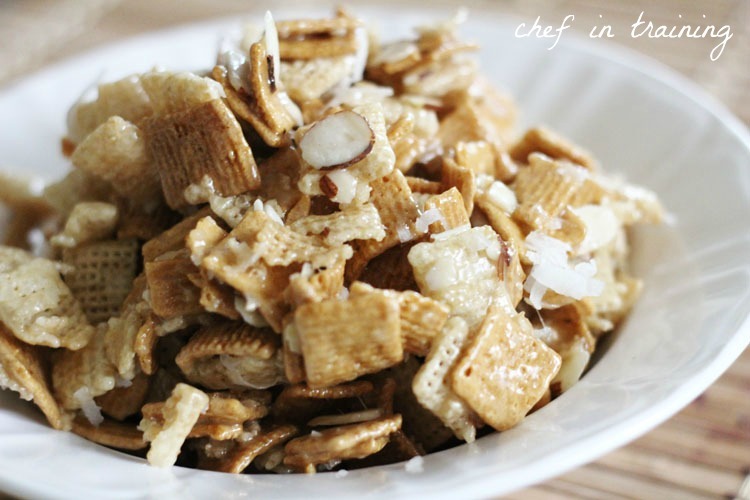 Looks great but I'll substitute Honey Nut Chex for golden Grahams to keep it Gluten Free. I've made one simular to this only used brown sugar instead of the white sugar. Sinfully Sweet! This looks like a fantastic after school treat! Yum!! I am making this for my family today. Thanks a million for sharing!! I love this recipe, my family has made it for years... except for we call it WONDERFUL STUFF!!!!!! This is a favorite at our house. I can't make it often because I cannot stay away from it. It is so, so yummy! I wonder how this would be with Chocolate Chex., or even the new Cinnamon Chex. What kind of Chex do you use? Thanks! Such a great holiday treat! I bet people would go crazy for this at a party. I just made this, I am on a diet & not allowed to eat it but I tasted it & Ooooooooooooooooh myyyyyyyyyyyyyyy!! This stuff should be called Snack Crack! So yummy!!!! Yummmm! I will be making this Saturday for Our Grandson's 10th BD!! The evening is family game and snack night!!!! This sounds awesome and I'd love to try it! But I try to stay away from corn syrup - are there any good substitutes? thanks! We call it "Christmas Crack" in my house. It is so yummy and addicting!! Can you think of a topping for this that wouldn't be "sticky"? It sounds wonderful, but kids, in a car, traveling...sticky fingers.. I was thinking of maybe boiling it to hard boil and making it crunchy,... would that work??? I am so sad to say this, but there is nothing healthy about this snack.